It's now been just over a week since my surgery. We again visited the Maternal Fetal Medicine doctor on Wednesday. He said things are looking good, but to keep bed-resting. I'm scheduled to see the doctor for rechecks every week now. I've been filling my time with a little reading (Calm My Anxious Heart by Linda Dillow, The No. 1 Ladies' Detective Agency by Alexander McCall Smith, and a few others), movie watching (Gilmore Girls and The Blindside), and some hand sewing to finish up a few quilts. Tom has been super helpful, keeping house stuff going and taking care of me. It's also been great to have friends bring meals and visit during the day. So far, the kitties are the biggest fans of bed rest. I've had several multi-hour nap cuddles from Orangey, and a few snuggles from Missy. Tom's pretty sure that when Haly is born, she is going to be disappointed that it's not me who purrs. It's also been nice to have some beautiful flowers to look at! My friend Kate brought be a companula. 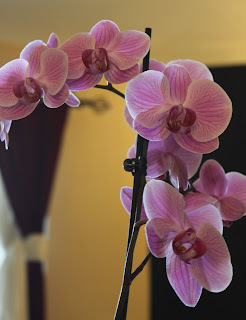 Alex & Kelly brought me this awesome orchid when I was in the hospital! We are coming to see you soon.. let us know if you need to borrow books or dvds .. or need us to stop and get you any crafty supplies!!! We saw Tom at church the other day, and it's been good to get updates from him. Please let us know if there's anything we can do. We'd be more than happy to bring over some meals, espcially freezer-friendly ones that you can pull out on those need-a-quick-dinner nights, even post-baby nights in the months to come. We care about you guys!